On Thursday, platinum was dragged down by a falling gold price with futures contracts exchanging hands for $938 an ounce, trimming year-to-date gains for precious metal to around 4.5%. While renewed weakness on gold markets is hurting the short term prospects for platinum, fundamentals for the metal which has a much bigger exposure to industry than gold remain strong and the fallout from a scandal in the automaking sector, platinum's number one demand source, has been limited. "It's not so much the size of above ground stocks but these investors' propensity to sell platinum to meet deficits. And the propensity to sell has definitely diminished"
The World Platinum Investment Council on Thursday raised its predicted platinum market deficit for 2017 to 120,000 ounces thanks to declining supply and solid demand. Following a wider than previously expected 2016 deficit of 270,000 ounces, 2017 would be the sixth consecutive year that global platinum consumption has outstripped supply as both mining output and recycling activity continue to moderate. WPIC's Q4 2016 report shows demand from the automotive sector which represent around 40% of the total defied expectations, ending the year up 1%. 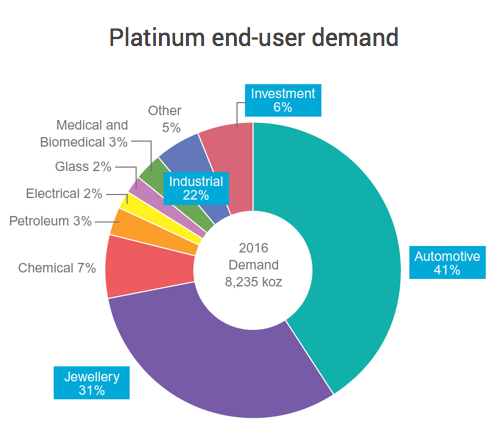 Europe's car manufacturers where diesel makes up 50% of the market are the top industrial consumers of platinum (palladium mainly finds application in gasoline engines and the sector is responsible for 70% of overall palladium demand). Year-on-year platinum demand from Europe has been higher in every quarter since the third quarter of 2015 defying expectations of a slowdown following the emissions cheating scandal at Volkswagen dubbed dieselgate that erupted September 2015. EU car sales hit a nine-year high in 2016 and the five largest markets – Germany, UK, France, Italy and Spain – all saw growth. The diesel share of new car sales was 49.6% in 2016, 2.5 percentage points lower year-on-year. Loss of share was highest in the Netherlands and Norway where electrified powertrains gained ground, owing to significant government incentives for purchasing electric vehicles. Automakers are keen to find cheaper substitutes for platinum and palladium in catalysts and to reduce precious metal loadings in vehicles. Toyota recently unveiled a technology that the carmaker claims reduces the requirement by 20%. Raymond points out so-called thrifting has been a factor in the industry since the introduction of catalytic converters in vehicles, but has been accompanied by ever more stringent emissions standards. That means platinum loading has stayed more or less constant since the 1970s at around 4g–6g on average per vehicle. WPIC's Q4 2016 report predicts after a slight bump last year, primary mine supply is predicted to fall by 2% compared to 2016 at 5.9m ounces with all the major producing countries cutting output and world number three producer Zimbabwe suffering a 7% decline. Annual supply from South Africa peaked at nearly 6 million ounces a decade ago, but is expected to contract to less than 4.2 million ounces this year as miners continue to be plagued by safety-related stoppages and operational challenges at the country's underground operations. North America experienced a 6% rise in refined production to 410,000, but should see a small decline this year. Despite restructuring of processing operations and an expected pipeline lock-up of 50–60,000 ounces, output from Russia remained stable at 715,000 last year and is expected to stay flat this year. Industrial demand grew by 5% to 1,76m ounces, boosted by capacity expansion in the petroleum sector. Autocatalyst recycling is expected to fall 6% while the volume of jewellery finding its way back into the supply chain is expected to plunge by a fifth compared to last year. The final quarter showed a marked increase in the buying of platinum exchange traded funds (ETFs) in the final quarter of 2016, which saw net buying 200,000 higher than in the previous quarter. That helped platinum ETFs to limit outflows for the year to just 10,000 ounces. A significant factor that has been putting a lid on price rises is the amount of above ground stocks of platinum (usually vaulted investor holdings), but the Raymond points out these have more than halved over the five years of supply deficits and is expected to have dwindled to 1.95 million ounces this year. "It's not so much the size of above ground stocks but these investors' propensity to sell platinum to meet deficits. And the propensity to sell has definitely diminished," says Raymond.